When it comes to “going out dancing,” most people think of it as a Saturday night type of affair—a chance to get dressed up and show off some sweet moves, staying up until the wee hours. 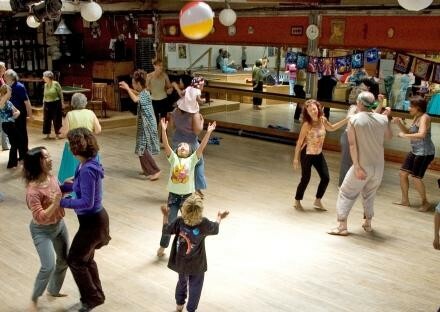 Well, it’s 11am on Sunday morning now, and for the dancers gathered at Ashkenaz Music and Dance Community Center, this is the perfect time to get their groove on. Inside the barn-like space, a trio of women in sweat pants and bare feet do an improvised line dance; a man lies still on the worn wooden floor with his eyes closed; others are stretching, or just swaying to the beat. There are adults and kids of all ages, including several toddlers and one small baby. People look comfortable, not dressed to impress. This is Soul Sanctuary, a community freestyle dance event that happens here every Sunday. Although the dancing itself is free-form, the two-hour event does have a loose structure. After a warm-up and arrival period, the whole group meets for a brief opening circle, then a long period of freestyle dancing. During this time, small groups coalesce and dissolve as people dance together and then by themselves. Some people lie or sit on the floor, some run or leap around the space, and kids dance and play with hoops and scarves. Handclaps and excited whoops occasionally echo around the space. In the last 15 minutes, people gather in a circle again and formally introduce themselves. Organic fruit is passed around this “closing circle” as people share their thoughts and experiences. One woman, who is here for the second time today with her young daughter, becomes emotional as she describes the good time she and her daughter have had at Soul Sanctuary. “Coming here I feel so free, so relaxed. And she’s so safe here, that I could be relaxed here. I was feeling so well that I almost want to cry,” she says. To read more and here the audio version of this story, visit KALW.org.